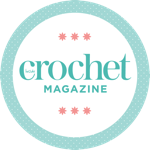 Meet Inside Crochet's brand new columnist. The lovely folk at Wonderwool Wales are giving away one pair of day tickets to one lucky reader. Win a copy of Crochet Learn It. Love It. We have a copy of Tracey Todhunter's fabulous book up for grabs. A lovely project from our latest issue. A stunning shawl from issue 110.